Update 7:30am 4/25/2015: Updating SPC graphics and a few other tidbits. Update 8:30am 4/25/2015: Updating with last update of SPC. Summary: Early site post due to threat of severe weather. Saturday looks rough. Be weather aware. Damaging winds, large hail, and isolated tornadoes possible. Note: Expect us to update this post several times before the severe weather threat is over. 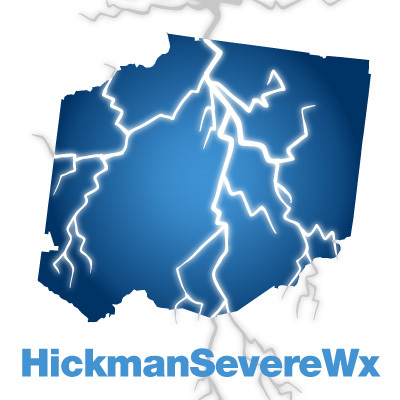 Follow us on Twitter @HickmanSevereWx for the most up-to-date and accurate information. Also, rely on several dependable weather sources such as news stations. Saturday is shaping up to be a major severe weather day. We will wake up to rain and thunderstorms in the morning, but these are not expected to be severe (one or two may start misbehaving enough to warrant attention, but generally this isn’t the severe weather threat we are looking at). 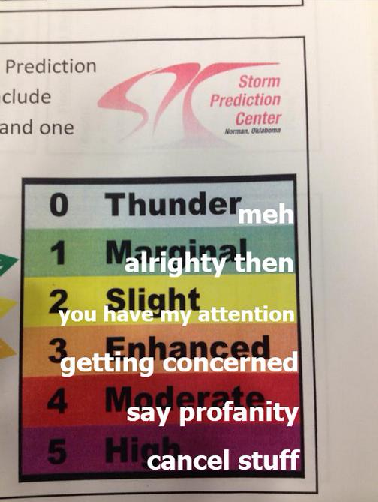 Here’s NAM4’s prediction of 7 am in the morning. Rain appears to be cleared out by 10am in the morning. Update 7:30am 4/25/2015: Welp, the rain moved out sooner than expected, which means that the models were a bust. Sometimes forecasts are wrong, and this morning’s was wrong. The paragraph below is still accurate though. While this appears to be a good thing, this will actually open the skies up to sun and daytime heating, adding to the mix of severe weather ingredients to make severe weather possible. We expect the clouds to clear up a bit and the sun appear for some of the afternoon. It is the afternoon and evening hours where the risk of severe weather is the greatest. The SPC has placed us currently under a SLIGHT risk of severe weather between 7am Saturday and 7am Sunday. This is as of this writing and could change by tomorrow and even multiple times Saturday. 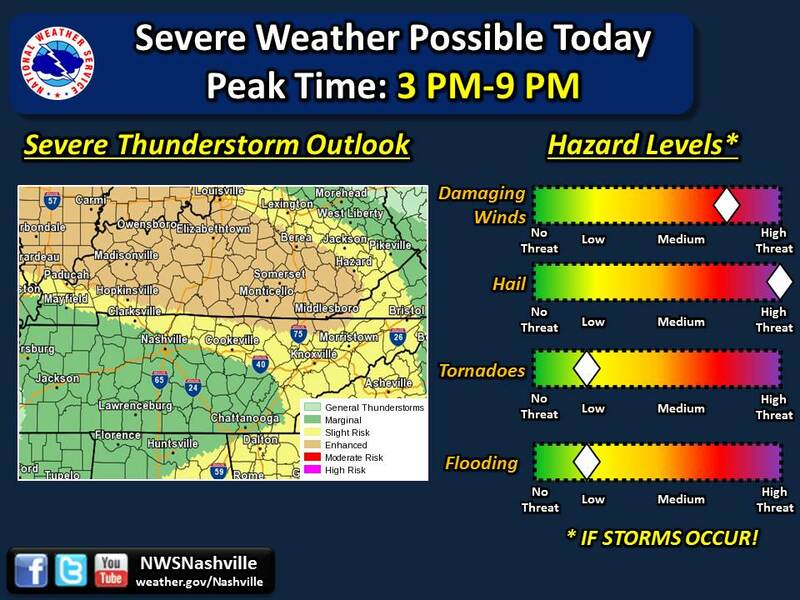 The main mode of severe weather is outlined in this graphic provided by NWSNashville: Update 7:30am 4/15/2015: New NWSNashville graphic below. Update 8:30am 4/25/2015: New NWSNashville graphic below. Update 8:30am 4/25/2015: The SPC has changed our outlook to be of MARGINAL risk, shifting the more significant chances north. Updated 7:30am 4/25/2015: While the Hazard Levels in the graphic above is still accurate, below are the new SPC outlook graphics issued this morning. Updated 8:30am 4/25/2015: New SPC outlooks below, with us in the MARGINAL category. New image below. Update 7:30am 4/25/2015: The SPC has us in a 15% chance for damaging winds within 25 miles of a point, 15% for hail within 25 miles of a point, and a 2% chance of seeing a tornado within 25 miles of a point. The graphics below are in that order: wind, hail, tornado. Update 8:30am 4/25/2015: Our risk of severe weather is now less, with 5% chance of seeing severe winds or hail within 25 miles of a point, and 2% chance of seeing a tornado within 25 miles of a point. New images below in order: wind, hail, tornado. Update 7:30am 4/25/2015: It appears the bulk of severe weather will stay along the Tennessee-Kentucky border, but just because these lines were drawn doesn’t mean that the storms will stay perfectly inside them. We are in the fridge, so we should be aware that storms could develop and impact us as well. DEVELOP THIS AFTERNOON AND EVENING...ESPECIALLY NORTH OF I-40. TO BE FROM AROUND NOON UNTIL 8 PM OR SO. Basically they are concerned that with daytime heating, instability, warm moist air, and other ingredients in place, storms that develop could turn into supercells and put down some significant size hail. Some of these supercells could strengthen and tap into extra instability and they could start rotating, causing a tornado or two. Some of these could be on the strong size (EF2+). The key word is isolated. We could not see any severe weather. Or we could see significant severe weather. Let’s hope for the former but prepare for the latter. I’m not posting any simulated radar models for Saturday afternoon as of yet, as storm location and intensity almost always change with every new model update. 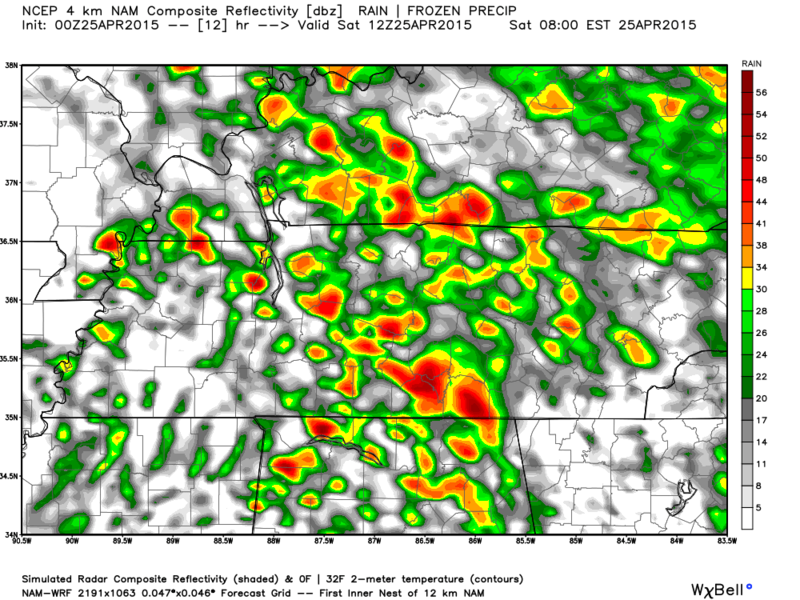 The models are indicating severe thunderstorms with possible supercells starting at about 2-4pm for Hickman County. Which brings me to the other key word: uncertainty. Things change quickly and there is a lot of uncertainty with this storm system. By Saturday morning some things start to become more clear, but until then we can only watch and wait, while being in prep and awareness mode. Update 7:30am 4/25/2015: The fact that this morning’s rain pushed out sooner than expected is a concern because it busts the forecasts (we at HickmanSevereWx don’t create forecasts, we just simply read them). This means that skies will clear sooner and open the doors to even more uncertainty. 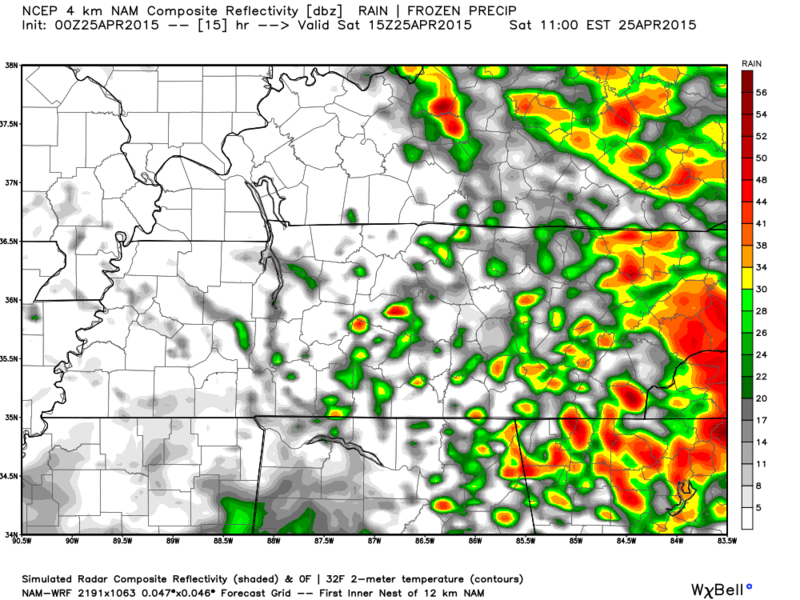 But it appears the best chance of seeing severe weather will be north of I-40 and into Kentucky. Update 8:30am 4/25/2015: With the SPC moving us almost completely out of the risk of severe weather, things are looking better for Hickman County. Don’t let your guard down and still pay attention to the weather, but it’s good news that our risk has gone down. Don’t freak out. Yes, it all sounds bad, but things are uncertain and likely to change. It is also very likely some of the midstate not see any severe weather. It’s important to stay aware of the weather, check the radar often on your phone or computer, and most importantly, keep your weather radio close by. If the skies start getting dark, immediately check a radar, check us out on Twitter and check out a local TV station. Now is the time to protect your property: bring cars in garages, find an indoor place for outdoor pets, secure outdoor light items and furniture.